Commercial Playground Equipment have evidently brought children back to the playgrounds. Kids who spend much of their time in front of the television can't resist the temptation of being out there on the ground and have fun with their peers. The commercial counterpart proved to be of greater importance on the conventional ones on account of being more creative visually and physically. In past one decade, commercial playground equipment have undergone huge makeovers. Gone are the days when one or two slides, a simple merry go round and tire swing were all a playground had. The contemporary equipment are made of a variety of material and are available in hundreds of shapes and colors. Not only are they delight to eyes, but they agitate every stimulus in kids. Classically, woods were used in making park equipment. This had more chances of children getting cuts and scratches as they had splinters and were not very soft. The modern version is coated with soft synthetics. If kids fall they are less likely to get bruised. It would sound like a cliché if I say that spending time outdoors is really good for children. Modernized playground equipment have not only brought children back to the parks, but they carry a lot of added advantages too. They are something more than just means of exercise. Over and over it has been said and observed that sharing, empathizing, competing with children of same age, later become an important part of an adult's personality. Spider’s walls, swings, rotating nets and basketball hoops are not only games, they help children develop mentally and increases awareness about their surroundings. 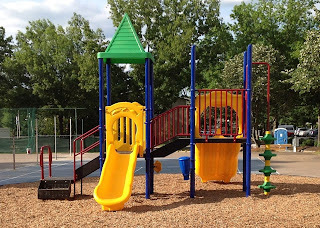 Children's playground equipment provide platforms of learning while playing. Successful in captivating children's visual senses, they are the best ways of having healthy fun. The equipment let children spin, slide, balance, hang and climb.